Our house in the village is like a train with a gap, like a bogey derailed. The gap is the living room that was never built and now it stands as the self styled mud room. The gap speaks of hope that one day the house will be completed. The hope has lasted for more than 15 years! Our home is simple but aesthetically challenged. It reflects a lack of architectural input and resources. People often mistake it for the village primary school a few meters away, or sometimes for the pastor’s quarter, traditionally built in an ‘L’ shape with many rooms to accommodate guests. Every time I come home there is new “technology” installed. My father loves to experiment with tools, electronics and machines, turning every room into a store room with wires running all over the house; plug points are dictated by his preference for sitting arrangement while typing. He is, by the way, the best typist I have ever known. When he first tried his hands on the computer, I thought the keyboard would break into pieces with the force he is used to, on old typewriters. This time there were fancy lights installed in and around the house that took me by surprise when I went to use the washroom. I was not expecting tiny bright diodes to light up my night activity. These fascinating patch-like diodes were fixed on the wall, taped on each end like it was hurriedly done for temporary use. Yet again they reminded me how the genes of style and utility are so far away from each other with men in general, and especially my father, for most houses in Ukhrul have wires and plug points hanging messily over the wall or from one corner, speaking of men and designs. Every house however has a number of interesting lamps, torch and light tools which are mostly made in China or Burma. For those who can afford it, the inverter is placed somewhere shabbily but owned like the most prized possession. The district, you see, has acute power shortage. These days the power supply is for an hour and a half during the day, and tactically from 10 pm onwards when the town is asleep so that mosquitoes, insects and animals can find their prey and their way home. In Tamenglong, local organizations had to shut the electricity department to register their protest of the dancing truant lights. People of the district have found better use for the electric wires—they take it home. This is legally called “stealing” and is so rampant that the DC of the town had to convene a meeting to take stock of the situation. Why blame the people for making use of resources around them I say with a smirk. One of the latest reasons cited for the shortage of electricity is the poor rainfall. By that logic, the God of rain is pleased with selective places in the State where people have been holy enough to receive rain and be lighted while the remaining can compensate with candlelight dinners! I don’t know if any of the reasons we have been hearing past many years is justified anymore but, in the words of Apou, my “memory bank” does not have any data of ever experiencing 24 hours power supply ever since we lived in the village. 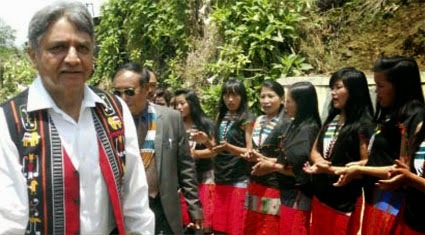 The last time people in Ukhrul had two days of uninterrupted power supply was when the Governor of the State was in town as the chief guest for Shirui Lily week. His visit was such a hit that the Facebook status of my town newsfeeders; Yoyo, Tennoson, Kahorpam and Khanthing, expressed “joy” like receiving rare grace that comes home like the uninvited guest. The statuses seemed to say that the town is beaming with life and energy and also lack of direction; of not knowing what to do with the suddenness of being lighted! The celebration however had to end the moment the Governor left. The set up, as I imagine it, is like the lineman was watching from a tower and as soon as he saw the dust and smog off the line of vehicles, he pulled the plug puffing a cigarette, much like how the curtains are drawn after a movie ends...ah, how dramatically he must have switched it off, and for the next two days the town was ‘powerless’. Perhaps the electricity department had to reclaim or make up for its generosity and the quota of the two days of lighting the Governor. We wait for the Governor and his entourage to visit the town again or, even better, if Narendra Modi comes to see Shirui Lily and tour the villages in Ukhrul... yawn yawn...while my father and families acquire newer tools to light homes and the companies and dealers lick their fingers counting the profits! **Tungshang Ningreichon is a happy mother from Langdang and writes occasionally for the love of stories, histories and memories.